​In this chapter, you will learn about physical principles of remote sensing and how sensors collect and record data. Electromagnetic spectrum and wavelengths are explained to help you understand how sensors detect reflected data. Transmission, absorption, and reflection are concepts of energy that are defined and exhibited in the content. You will also learn about passive sensors, optical and satellite sensors and active sensors such as RADAR and LIDAR. Describe the basic physical concepts on which remote sensing are based such as the electromagnetic spectrum, reflection, and absorption. Explain the physical differences between active and passive remote sensing systems. How do our eyes limit the various ways we can "see" the environment? What role could remote sensing have on understanding Earth in a way that is not possible with our own senses? The Sun is the dominating force of our solar system. It comprises 99 percent of the mass of the solar system and would require 109 Earth’s line up side-by-side to span its diameter. But the Sun is an average star in the universe and about 4.6 billion years old. If the Sun was more like a blue giant, meaning 10 times more massive, it would have died off long ago in a supernova; and if the Sun was smaller, it would not produce enough light and energy for life to exist. Hydrogen accounts for 92.1 percent of all the atoms in the Sun followed by helium at 7.8 percent. The Sun is fueled by thermonuclear reactions at its core, in a process where hydrogen is fused to make heavier helium elements, which results in an enormous release of energy. The energy created by the sun is in the form of electromagnetic energy, which travels at the speed of light (299,792,458 meters per second) in a spectrum of varying wavelengths. Forty-three percent of the energy is in the visible spectrum, 49 percent as long wave radiation (also known as heat), and 7 percent as shortwave radiation such as X-rays, gamma rays and UV radiation. Ultimately, our star will begin to use up its energy and begin to expand into what astronomers called a red giant. That means it will grow and overtake Mercury, Venus, and possibly Earth and Mars. Over a few million years, it will shed its outer shell of gas into space, while the inner core compresses to become a white dwarf. Over time, the core will cool into a cold rock and then game over. ​Before jumping into particular sensors and digital image processing, this chapter focuses on the physical principles of remote sensing and how sensors collect and record data. Most of the remote sensors that will be used in this course will detect reflected energy from the Earth that originates from the Sun. Some sensors such as RADAR and LiDAR provide their energy source. Figure 1 illustrates how some of the energy from the sun is scattered or absorbed by the atmosphere. The energy that reaches the Earth’s surface will have interactions with the objects it hits. In some cases, the energy is absorbed by the vegetation, ground, or water. In other cases, energy is transmitted through the object and passes onto another object. In still other instances, this energy is reflected back through the atmosphere of which some of the energy is absorbed. The rest will pass through the atmosphere and be recorded on the remote sensor’s electronics. When talking about energy from the Sun, photons are quantities of energy that move at the speed of light. A relationship exists between the frequency and wavelength of a photon and the speed of light, which can be expressed as an equation indicating that the speed of light is a combination of the specific wavelength of light and its frequency. The next equation shows that by arranging the first equation, the wavelength can be measured by taking the speed of light and dividing it by its frequency. Since the speed of light is a constant value of 300,000 km/hr (or 186,000 mi/hr) different kinds of light energy can be measured by its wavelength. Image copyright: This image is licensed under the Creative Commons Attribution-Share Alike 3.0 Unported license. The energy that hits the Earth is considered electromagnetic radiation because the energy consists of two components of both electrical and magnetic waves. The main idea behind remote sensing is the recording of reflected electromagnetic radiation by sensors that are distant from the object being sensed. The electromagnetic energy is commonly referred to as light. Light energy is characterized by a wavelength and frequency and together defines a distinctive color. Let's get some more terms down. 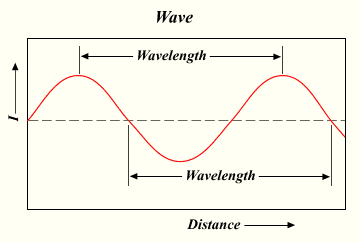 A wavelength is the distance between two wave crests (or two wave troughs); the higher the wavelength, the shorter the distance between two wave crests. These different wave patterns form when an electron accelerates at a particular frequency. Frequency is the number of oscillations (wave crest to wave crest) that completely passes a determined point within one second; the higher the frequency, the more oscillations per second. Because there is a continuum of electromagnetic radiation, different kinds of electromagnetic waves have different frequencies. Together, the higher the energy means a higher wavelength and higher frequency for a particular wave. As humans, we see only the visible portion of the electromagnetic spectrum, which is composed of smaller and longer wavelengths that surround the visible section.. The full range of wavelengths is called the electromagnetic spectrum. Electromagnetic waves that have higher energy states will have shorter wavelengths and higher frequencies. Electromagnetic waves that have lower states of energy will have longer wavelengths and shorter frequencies. For example, X-rays such as those that humans are exposed to when they are at the dentist or doctor’s office have shorter wavelengths. Radio waves, on the other hand, have longer wavelengths and provide the means for us, humans, to listen to the radio portion of the electromagnetic spectrum. ​To provide a more thorough introduction to the electromagnetic spectrum, watch the following videos created by NASA that focus on: the electromagnetic spectrum, the visible portion of the electromagnetic spectrum, and infrared waves and their uses and remote sensing and science. 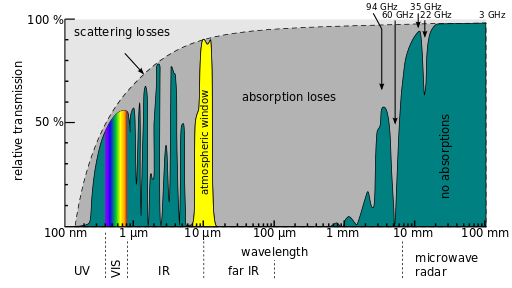 The image above illustrates the continuum of the electromagnetic spectrum from shortwave (left of spectrum) to visible (middle) through long wave (right of spectrum). Although the human eye is not capable of “sensing” this part of the electromagnetic spectrum, it is very import to remote sensing, since much of the valuable information content can be detected and recorded on remote sensor devices. The microwave portion of the electromagnetic spectrum is indicated which ranges from approximately 1 centimeter to 1 meter. RADAR sensors operate in this part of the spectrum. When analyzing and processing remotely sensed imagery, it is important to know which wavelengths the remote sensors can detect and record. The wavelengths for the respective portions of the electromagnetic spectrum shown in the graph are noted on the slide. The unit of measure for these wavelengths is either nanometers or microns (also known as micrometers). ​Depending on the sensor, other portions of the infrared part of the electromagnetic spectrum will be detected at approximately 1.6-1.8 microns and about 2.1 to 2.4 microns. These sections of the electromagnetic spectrum are sometimes referred to the short wave infrared. On some remote sensors, such as Landsat, the wavelengths between 8 and 14 microns are detected and recorded. This section of the electromagnetic spectrum represents the thermal wavelengths. This section is sometimes called the “heat” band(s) since these wavelengths represent objects that emit thermal radiation such as cooling towers at power plants. Some handheld thermal sensors can pick up body heat. ​Let's briefly go over the measurement units used with measuring light. Short wave energy is usually measured in nanometers (nm), which is equal to one-billionth of a meter. The visible and long wave energies have lone longer wavelengths and are measured in micrometers (mm), which is equal one one-millionth of a meter. The short wave spectrum consists of a short wave, high frequency energy such as gamma rays, x-rays, and ultraviolet radiation. Most of this energy is absorbed by the upper and mid-regions of the atmosphere. For examples, by the time UV radiation reaches the middle of the atmosphere, called the stratosphere, it is absorbed and reradiated by the ozone layer into a less dangerous energy type. The portion of the spectrum that we can see with our eyes is the visible spectrum, which is roughly between 0.4 to 0.7 mm. This spectrum is usually broken down into smaller ranges of wavelengths called bands. The blue band ranges from 0.4 to 0.5 mm, the green band ranges from 0.5 to 0.6 mm, and the red band ranges from 0.6 to 0.7 mm. It is these three bands most commonly used in remote sensing to view the visible spectrum. The infrared portion of the spectrum contains longer wavelengths than the color red, ranges between 0.7 to 100 micrometers, and is quite useful when studying environmental features such as vegetation. Like the visible spectrum, the infrared spectrum can also be broken down into smaller bands. The near infrared (NIR) ranges from 0.7 to 1.3 mm, the middle infrared (MIR) ranges from 1.3 to 3.0 mm, and thermal infrared (TIR) ranges from 3.0 to 14.0 mm. Generally, in GIS, and remote sensing, the visible and infrared portions of the electromagnetic spectrum are the most widely used portions of the spectrum. It is important to understand aspects of the Sun and electromagnetic radiation because it is this reflected energy that makes up the electromagnetic spectrum that is recorded by remote sensors. Electromagnetic energy is all around us and is constantly striking objects. The energy is then reflected, absorbed, or transmitted from those objects back to our recording sensor, such as a camera. The energy that is reflected is what it appears as in the picture. In the visible spectrum, if an object reflects the color green, and absorbs all other colors in the visible spectrum, we will record the green wavelength for that object in our sensor. In addition to the energy being reflected from the visible portion of the electromagnetic spectrum, it is also simultaneously reflecting, absorbing, or transmitting electromagnetic energy outside the visible spectrum. We may, or may not, see the electromagnetic energy outside the visible spectrum based on which portion of the spectrum the sensor is calibrated see. Agricultural farm in the visible spectrum. Sam agricultural farm in the infrared spectrum. We will now look at an example of an image taken of a farm in South Texas. The image on the left represents the visible portion of the electromagnetic spectrum, and therefore, the healthy vegetation shows as green. Based on what we can see in the visible spectrum, the crops look perfectly healthy. However, let’s now take a look at the same crop but focusing on the infrared portion of the electromagnetic spectrum. 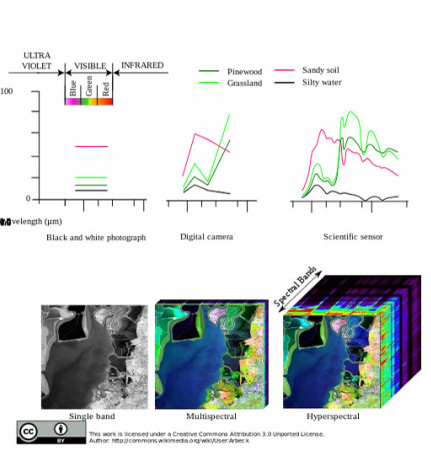 The image on the right shows a different story of the crop area in the electromagnetic spectrum, healthy vegetation reflects a large amount of infrared energy. In the infrared spectrum, the dark red areas are where the crops are healthier. However, in the lower left portion the red looks lighter, indicating that the crops in this area are less healthy because of unusually high salt content in that portion of the farm. This kind of imagery analysis is used not only for agriculture, but in determining the health of forestry such as disease or bug infestation and in drought monitoring. It is also used to monitor potential famine situations like in the Horn of Africa. One such agency is the Famine Early Warning System (FEWS NET). Once the electromagnetic radiation reaches Earth, the energy begins to interact with the atmosphere and surface objects in ways that must be understood by those who use remote sensing for analysis. Let’s first focus on Earth’s surface. When the electromagnetic radiation comes into contact with the Earth’s surface, land or water, it is called incident radiation. This is because three things can happen to the energy; it can be reflected, transmitted, or absorbed depending on the physical composition of the object, its biological and chemical makeup, the wavelengths and frequency of the energy striking it, and the angle at which the energy strikes the object. When the electromagnetic energy is reflected off an object, it bounces back into the atmosphere. The type of reflectance is determined by the ratio between how much energy strikes the object versus how much bounces back into the atmosphere. Reflection can be broken down further into specific types based on how the energy strikes the object. If an object is smooth, such as a very calm lake or ice like a glacier, nearly all of the energy that strikes the object is reflected away at the same angle it was received, but in the opposite direction. This type of reflection is called specular reflection. Now if the object is very rough and rugged, the energy striking the object will get reflected in multiple directions, called diffused reflection. The type of these two diffusion is also depending on the wavelengths of the incoming incident radiation. If the wavelength of the incoming energy is larger than the individual particles it strikes, the reflection will be specular. If the wavelength energy is smaller than the individual particles it strikes, the reflection will be diffused. Transmission is the term used to determine if electromagnetic energy can move through an object, such as water. Transmission is highly dependent on the wavelength of the energy reaching an object. The third type of incident radiation is absorption, which is the ratio between how much energy is absorbed by an object and the incident radiation. Ultimately, incident radiation is a mathematical equation expressed as: Incident radiation = reflected radiation + transmitted radiation + absorbed radiation. We have all experienced scattering of incident radiation when you shut off the lights during the daytime and still have light in the room. Atmospheric Scatteringis caused when energy strikes atmospheric particles (e.g. atmospheric particles and aerosols like smoke, ash, salt, or condensed water) and is redirected in multiple directions away from its original intended direction. Rayleigh scattering occurs when the atmospheric particles are smaller than the wavelength of the incident radiation. Another type of scattering is called Mie scattering, which occurs when the atmospheric particles are about the same size as the wavelengths of the incident radiation impacting it. Atmospheric particles of this size include smoke, ash, pollen, dust, and water droplets. The third type is called non-selective scattering tends to occur in the lower atmosphere where particles tend to be larger than the impacting wavelengths. Another important process we must consider is atmospheric absorption, a process where electromagnetic radiation is selective absorbed dependent on atmospheric molecules and the wavelengths of radiation. The major atmospheric players here are ozone, carbon dioxide, and water vapor. These three molecules, along with others, are often called selective absorbers. A selective absorber are molecules that will “selective absorb” specific wavelengths at a specific absorption percent. Ozone tends to absorb short wave radiation, specifically ultraviolet radiation, while carbon dioxide selective absorbs long wave radiation in the range of 13 to 17 mm. Water vapor, the strongest greenhouse gas, can absorb energy with wavelengths ranging from 5.5 and 27 mm. It is considered the strongest because of its ability to absorb such a wide range of long wave radiation. So when the electromagnetic radiation comes to Earth, most of the short wave energy gets absorbed before entering the lower atmosphere, for example the ozone layer absorbing the ultraviolet radiation. Once it reaches Earth’s surface, it can be reflected, transmitted, or absorbed by objects on Earth’s surface. The third step is that the reflected energy must pass through the atmosphere again before it can reach the orbiting satellites or other remote sensing sensors. The amount of energy that reaches the remote sensors is again dependent on several variables, which includes the composition of the atmosphere, wavelengths of the incident radiation, and the length the reflected energy must travel to reach the sensors. Atmospheric molecules, however, cannot absorb all the energy reflected from Earth’s surface. Certain portions of the electromagnetic spectrum can successfully pass through the entire atmosphere and reach the sensors of orbiting satellites. These portions of the atmosphere where radiation can pass through and into space are called atmospheric windows. Specifically, these “windows” include the entire visible spectrum (0.4 to 2.5 mm), mid-infrared spectrum (3 to 5 mm), the thermal spectrum (8-14 mm), and microwave radiation (10 to 30 mm). It is in these specific atmospheric windows that we can analyze the Earth using remote sensors. This image is licensed as Creative Commons Public Domain. Let’s refer back to when we were discussing the interactions of electromagnetic energy with the Earth’s surface. It probably makes sense that different objects have different reflectance and absorption values. A white, smooth glacier would reflect electromagnetic energy quite differently than a forest, farmland, or rock outcrop. Even more, as was discussed earlier, unhealthy vegetation will appear different in the visible spectrum and infrared spectrum. Seasonality will also play a role in how objects on Earth will appear in each spectrum. That’s why it’s important to try to compare imagery in the same season if you are analyzing glaciers, vegetation, or even land use patterns. When we graph the spectral reflectance of an object based on wavelength and percentage of reflectance, we begin to generate a spectral signature. A spectral signature is the percentage of total incident energy that is reflected by an object. Think of it like a spectral fingerprint of an object that allows for accurate identification. If we know what object we are looking for and what its spectral signature should be, we can properly identify that object compared to the spectral signatures of its surroundings. An unhealthy portion of a forest will have a different spectral signature compared to the signature of the surrounding healthy forest. That could aid the forest agencies in identifying potential problems such as infestation, disease, or environmental pollution. This image is licensed under the Creative Commons Attribution 3.0 Unported license. Earlier in this chapter you learned that the primary source of energy for remote sensing comes from the sun. In greater detail, passive and active sensors are defined. A sensor that images this reflected energy is considered to be passive. Passive sensors include all of the optical aerial and satellite sensors. Optical sensors refer to those that contain lenses that help resolve the features at are being sensed. Another kind of sensor that is used for remote sensing is considered active. Active sensors are those that have an energy source on board the instrument. RADAR and LiDAR are active sensors. RADAR and LiDAR will be discussed in more detail in the lesson, Sensor Platforms, Image Processing Basics, Band Ratios, and Transformations. Figure 7 illustrates the differences between Passive Sensor (e.g. Landsat) vs. Active Sensor (e.g. RADARSAT): The illustration on the left shows the Sun’s energy reflecting off of objects and getting recorded on the remote sensor. Some of the sun’s energy is reflected or absorbed by the Earth’s atmosphere. The illustration on the right shows an active RADAR sensor that emits radio waves that hit objects on the ground. The energy is reflected back to the sensor and recorded. RADAR waves are capable of passing through the Earth’s atmosphere and so can collect information when it is cloudy or when it is dark. In this lesson, you learned about physical foundations. Electromagnetic spectrum and wavelengths were explained to help you understand how sensors detect reflected data. Transmission, absorption, and reflection are concepts of energy that were defined and exhibited in the content. You also learned about passive sensors, optical and satellite sensors, and active sensors such as RADAR and LIDAR.